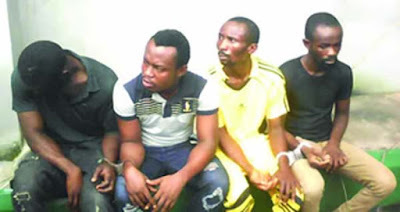 The Abia State Police Command has arrested four suspects for alleged arm robbery and kidnapping. A police source said on Tuesday that the suspects were arrested following a complaint of a threat to kidnap a resident of the state. The source said police operatives swung into action as a result of the complaint and arrested the suspects while they were still planning the attack. Three of the suspects identified as Chinedu Samuel, Emmanuel Okechukwu and Izuchukuwu Ajaegbu were said to have confessed to the crime. Okechukwu reportedly said that one Anurika introduced him to a gang of armed robbers and kidnappers, adding that the gang was abducting schoolchildren for illegal adoption and adults for ransom. He was alleged to have stated, “It was Anurika that introduced me to the gang. We started by kidnapping two schoolchildren from Mbaise in Imo State. “The men in our gang kidnap kids and hand them over to Anurika to sell. We normally attract the kids with biscuits. We started kidnapping adults when one gateman in Aba told us that his boss was not paying him well. “I sold the idea of abducting the man for ransom to him (gateman) and he accepted it. We planned the deal and picked the man and we collected N5m as ransom from his family. The Police Public Relations Officer, Abia State Police Command, Mr Geoffrey Ogbonna, confirmed the arrest of the suspects. Ogbonna said they would be charged to court, adding that the command would speed up its efforts towards arresting other members of the syndicate currently at large.